A little room needs to be made on the escalating ladder of UK Americana as Hope in HIgh Water formally announce their arrival on the burgeoning scene. Eliminate the country and rock elements of the genre, for this is a classy display of folk and roots rinsed in real life soil. 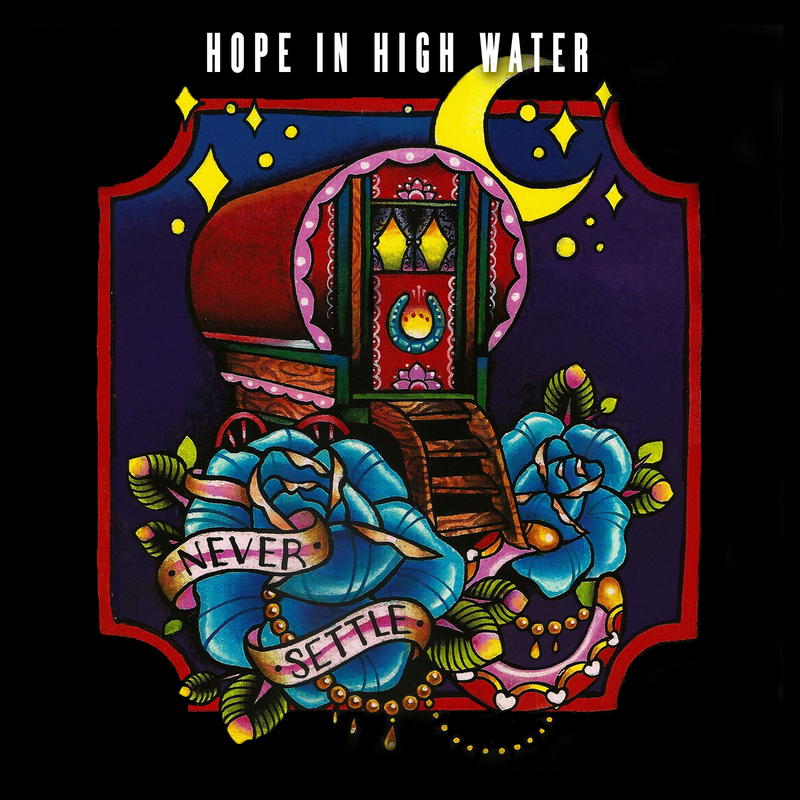 NEVER SETTLE is the debut full length release by a duo consisting of Josh Chandler Morris and Carly Slade, who under their evocative moniker have been steadily establishing themselves primarily on the live circuit over the last couple of years. Now, apart from an earlier EP, newly acquired fans can take home a more substantial souvenir and while the gigs are likely to remain the staple in the near future, promotion to fresh audiences is far more viable with a tangible offering. The album is not out of place when likened to similar sounding records on either side of the Atlantic, although it would be remiss to infer that there is anything pseudo about Josh and Carly’s approach to making music. Any connection with our colonial cousins stems from the stripped back instrument input dominated by fiddle and banjo alongside a desire to dig deep into the bosom of human emotion. On a literal platform, this music originates from the modernist surroundings of Milton Keynes, yet a little delving into the background would suggest that a static life has been far from reality. One assertion that the press release is spot on with is the likeness to Shovels and Rope. It took barely a minute into the opening track ‘Time Shall Pass’ for this to leap out and one that paved the way for the remainder of the record to flicker high on the enjoyment scale. Vocal utilisation plays another vital role in framing the success of this record, probably from a solo angle rather than harmony. The contrasting styles work well to keep the listener alert. There is a gruffness to Josh’s in line with some of the road weary protagonists who make their music from the ground up. Maybe not to the ultimate extent on the harsh scale, but there are still remnants of Otis Gibbs especially in the track ‘Angels in Heaven’. On the other hand there is a slender fragility to Carly’s vocals which once again have the connotation of belying a steely heroine. She sparkles on the promoted track ‘Four Strange Walls’, but in my view she exceeds this in the mystique jazz number ‘She Cries’. The album almost becomes an alternate affair in the vocal stakes as the final two tracks – ‘Heartaches on Hold’ and ‘When Sorrow Calls’- exchange lead player. You should now be getting the drift of the slightly solemn themes from extracts of each song title. What else would you expect from this genre? You can also choose to delve more into each of their backgrounds and this will probably shore up the musical direction. On the other hand just taking in the pleasing tones from a straight forward listen to their recorded material will inform you of their impressive ability to make good music. The sparse feel to the production is in line with the intention to make real earthy music. A mid tempo approach to the pace allows each song to develop with perhaps the two more prominent deviants being the faster ‘Forgive Me’ and the toned down ‘Late Nights’. Fine melodies and purposeful song structures are definitely in place. Perhaps the wider availability of a lyric sheet would enhance the enjoyment of those who like to peruse that aspect of the music. 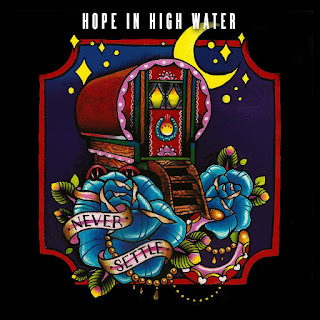 NEVER SETTLE is a commendable record to take the career of Hope in High Water forward suggesting that there is much more in the can. It comes across as a real interesting mix of idealism and reality; not a bad formula to inject into your music.